The latest premium download for Access All Areas members is a great design resource from Freepik to make use of during the festive period. 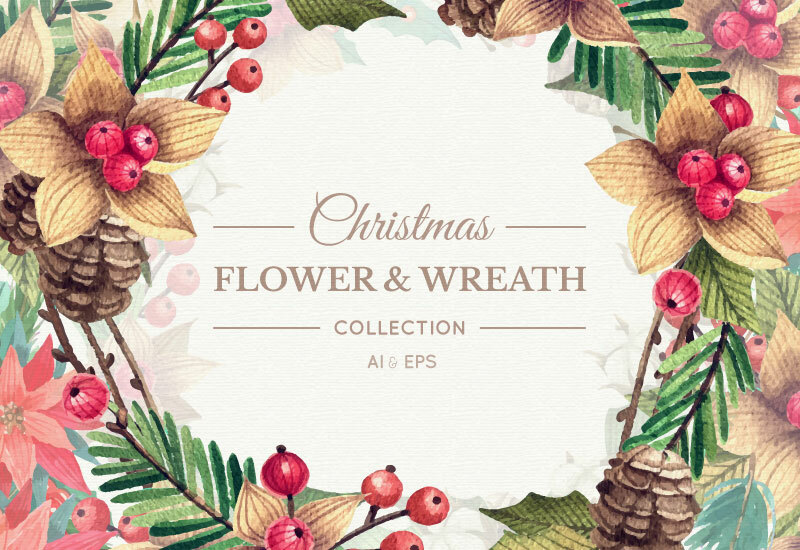 This Christmas Flower & Wreath collection contains 7 vector illustrations in AI and EPS format, with a mix of single colour and full colour artworks. They make fantastic decorative elements for your Christmas related designs, although the individual flower graphic could also be used to create elegant designs all year round for weddings and rustic themed projects. This Christmas Flower & Wreath Collection provides over 35 flower, leaf, fruit and twig illustrations that can be combined to create detailed wreaths, or used individually within your artworks. 7 ready-made wreath layouts are supplied in both single colour and full colour variations that can be quickly used to decorate your designs during the festive period. Vector AI and EPS files are supplied, making these resources perfect for all kinds of design uses, from large format prints to small promotional web graphics. These are very nice! Thank you! And, thanks to Free-Pik! They have so much cool stuff! Thanks Su, always appreciate your feedback! Thank you! free pick for the win!